governance and how is it evolving? These are the major questions addressed in this book. The author has been an observer and participant in the development and use of the Internet in Africa, Asia, Russia, and the United States, but above all in Brazil. He has interacted with many pioneers of the Internet around the world who have inspired and help educate him. This book, completed one month before the Global Stakeholder Meeting on the Future of Internet Governance (NETmundial) in São Paulo, seeks to provide background that will be useful to participants in that important gathering and to Internet enthusiasts in Brazil and around the world. Peter T. Knight is an economist specialized in the use of information and communication technologies for accelerating economic, social, and political development. A resident of Rio de Janeiro since 2000, he is a founding member, researcher, and member of the Board of Directors of the Fernand Braudel Institute of World Economics in São Paulo and has worked as a consultant sinc 1997. During 20 years with the World Bank, he was Lead Economist for the Brazil Department, Chief of the macroeconomic management division of the Economic Development Institute, and Chief of the Electronic Media Center. Previously he held positions at Cornell University, the Ford Foundation and the Brookings Institution. Peter holds a PhD from Stanford University and degrees in Government from Dartmouth College and Politics, Philosophy and Economics from Oxford University. He has published ten other books, six of them dealing with the use of the Internet for development. Demi Getschko, Member of the Brazilian Internet Steering Committee (CGI.br) and Chairman Executive Committee of the Brazilian Network Information Center (NIC.br). "This is the right book at the right time, when Internet governance is in the headlines. The political visions behind Brazil's governance system are very advanced and embody the rich diversity of our academic, political, technical, entrepreneurial, and civil society stakeholders. That diversity has allowed the Internet to flourish in our country. Peter Knight captures all these visions in a book that the reader will find both provocative and pleasurable to read." Michael Stanton, Director of Research and Development, National Education and Research Network (RNP). "This book provides a very informative description of how Brazilian governments and allied institutions have together built, and continue to extend, the communications infrastructure required for a modern knowledge-based society. The job is by no means complete, but the book shows examples of how future extensions can continue to be built to improve the result. Unsurprisingly, a common thread throughout the book is the emphasis on providing ubiquitous fiber optical infrastructure so that future expansion can reuse existing communications cables." Steve Goldstein, Former National Science Foundation Program Officer for International Internet Connections and former Member of the Board of ICANN. 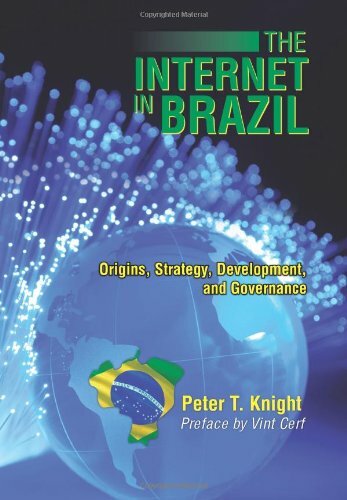 In this short book, Dr. Knight, a World Bank, Washington, transplant to Brazil, moves from a meticulously detailed rendition of the development of networking in Brazil through to the adoption of Internet technology by the academic community. Then, he follows the path to commercialization and present day status and the very latest global policy implications for Internet governance (e.g., NET Mundial). A gift to Internet historians and policy wonks as well! Nagy Hanna, Author, Advisor, Academic. Former senior advisor on e-transformation and chief strategist at the World Bank. The Internet is central to realizing any eTransformation strategy. Harnessing this 21st century infrastructure is increasingly critical for the economic health and competitiveness of nations. Peter is a keen observer of the Internet's evolution, use, and governance in Brazil. This book is a timely and readable analysis that should help both external observers and Brazilians understand this important country's approach to the Internet. Vanda Scartezini, Former National Secretary for Information Technology Policy, Brazilian Ministry and Science and Technology, and twice member of the Board of Directors of the Corporation for Assigned Names and Numbers (ICANN) and Member of the Internet Society, Brazil Chapter. Extremely relevant for rescuing the memory of Internet's evolution in Brazil. The book provides an excellent opportunity for the youth of today and tomorrow understand the path that led to them this fantastic opportunity for personal and social development that is the Internet.